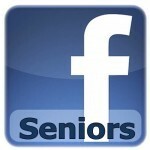 This is for those of our older generation who do not really comprehend why Facebook exists. (Presently, I am trying to make friends outside of Facebook while applying the same principles). I also listen to their conversations and I tell them I love them. And it works.